What’s your business ambition right now? Do you want to raise your business profile? Do you want to attract more customers? Put your prices up? Or make more profit? Or like 81% of people, have you simply always wanted to write a book? If any of those goals are ringing true for you join the From Knowledge to Profit course. If this sounds interesting, follow the link to discover more about the From Knowledge to Profit course. But act fast: you can only sign up until 1 Feb, and you start work at the end of next week! Why work with Antonia and Erica? I’ve self published books, and ALWAYS made a profit. I’ve discovered how to sell books when you have thousands of copies of a self published book sitting in a garage! And I’ve found out how eBooks can take the risk away of investing in printed books. I’ve promoted my own books, and those of other people: I can tell you how to sell 100 books from an email. I’ve worked through all the hard ways of promoting an eBook, and discovered all the smart ways. I’ve built up a great team who help my books succeed and they will be supporting YOU too. Sell the book direct from your own website. Add your book to Amazon Kindle. You can’t afford to miss out on the biggest eBook-buying audience. Add your book to the other sites that are already selling millions of eBooks. We share them with you in the course. Develop consultancy or individual coaching services to solve the same issues you address in your eBook. Offer group training, workshops or group coaching. With your profile as an author, it’s much easier to sell places at your own events. Contact people who have bought your book direct from your site and offer them other products and services: if they love what you have written they will be keen to buy again. Create an affiliate scheme so other people can sell your books for you. With an eBook there is no post or packing so you can give them a great incentive AND still make good profits. Get in touch with conference organisers offering to speak, and include a copy of your book. I’ve made over £1000 by speaking at a single event AND got extra consultancy work afterwards from attendees. Turn your book into an online course. Some people much prefer eLessons to reading a book, and you can add value with a member site too. If you ask for a small monthly subscription fee for your course you can create a regular stream of income. Just pick a few of these ideas and you’ll not only make back your course fees, you’ll also have plenty of streams of ongoing income that will allow you to do the work you love AND have time to follow your heart’s interests too. Join From Knowledge to Profit, and Antonia and Erica tell you much more about creating your eBook AND making it a profitable business asset. You need to sign up by 9pm GMT on Wednesday 1st February to take part. I don’t need to remind you that being an author can raise your profile, attract more customers and clients, bring in more business and allow you to put up your prices. There is proof all around you when you see authors speaking at conferences or running well paid training and think ‘I wish that was me’. Well, it could be you. That’s right. Join the From Knowledge to Profit course by by 9pm on Wednesday 1st February to take the first step to creating an eBook. Just tell them Becky Willoughby sent you! The first thing to remember is that the Internet is a big place and if you put something out on the web you never know who will see it. So if its something you don’t want other people to know then don’t put it on the Internet! On sites such as Facebook you can strictly limit who sees what but still it is safer to keep information such as your date of birth to just the day and month. For people wanting to steal your identity the key bits of information they need are your name, date of birth, address and mother’s maiden name (why can’t companies choose a more original bit of data for security?). It may be tough to remember more than one password but if you only have one and someone works it out they could hack into any site you use it on. When choosing passwords try and make it complex using a mix of upper and lower case and numbers. Try not to choose something too obvious – you would be amazed at many people choose password123 as their password! I also advise youngsters not to put pics of themselves showing an obvious school uniform logo on it. The same should apply to parents when posting photos on a public forum where you have no control over who sees it e.g. Blipfoto. Be cautious with pop ups on web sites. Often they are trying to install spyware or viruses on your computer. If you get a message in one saying that you have been infected by a virus whatever you do don’t click on it to remove – make that window close instead. Basically just use the Internet with common sense and try and keep safe. 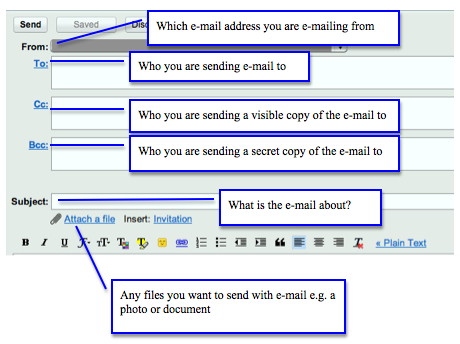 I have used the Google Mail new mail form to demonstrate the basics points of e-mail creation. I chose this one as it is free to use. I will go into more detail about e-mail elsewhere in this blog. IT Simple Tip #2: Acronyms etc. The Internet and computers are confusing enough sometimes and then people throw acronyms into the loop it can seem like trying to read a foreign language. A lot of them are used to replace the fact that there is no visual contact with the person writing the message. Here are just some of the more common ones that pop up on websites, social networks and text messaging. There a re lot more but these are just a few that may confuse or mislead! I have to start somewhere so starting with something simple! During my years working in schools I discovered that it was things like learning basic keyboard shortcuts that made people’s lives a lot easier. There are many more shortcuts that each application uses but the the four above are the ones that you will use on an almost daily basis. More tips to come and please feel free to prompt me with a question!